Mcklein's Chicago Laptop Case has removable wheels, room to spare and a bonus removeable briefcase . 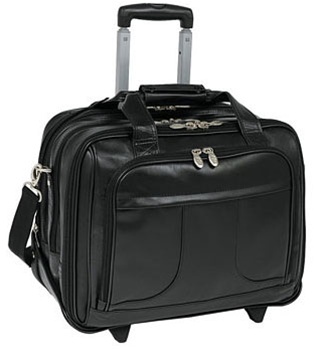 Here's a laptop case/briefcase that can even be your overnighter. Detachable wheels make it easy to transport whatever you need without pain or strain...carry the case without wheels or get rolling with the patented wheel system. The McKlein Chicago laptop case even has a briefcase inside of the case! Don't strain on those business calls, McKlein has the wheeled solution. Front organizer pocket for media devices, cell phone, business cards, key holder and pens. Smart Attachment Strap & Smart Zipper Attachment allows transport on extended handles of other rolling cases and luggage. Size: 17" x 11" x 13" Laptop interior dimension: 16.5" x 3" x 12" Fits laptop up to: 17"
Hand strap drop length: 4.5" Shoulder strap drop length:14.5-21.25"